When Marium Rana was deciding where to attend college, she was encouraged by the prospect of being able to study with professors at Florida State University who were as excited about painting as she was. As a junior, Rana won an Undergraduate Research and Creative Activity Award from the university’s Office of National Fellowships. She used the award, which comes with a $4,000 stipend, to spend the summer of 2011 studying the miniature painting of the Mughal Empire on the campus of the National College of Arts (NCA) in Lahore, Pakistan. 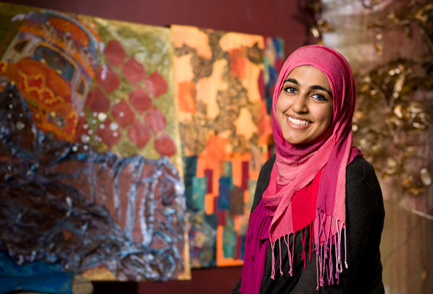 While taking individual lessons from an NCA art professor, Rana was able to cover a four-year curriculum in two months. The painstaking, four-step process begins by using a pencil to draw out the image. The next step is sayyah qulam, using highly pigmented watercolor to create a thin, dark outline over the pencil lines. This is followed by namerang, using shades of black color to fill out the monochromatic image. Finally, color is added in the next step, known as gudhrang. Beyond her study of painting while in Pakistan, Rana was disheartened to see some of the extreme poverty of that country. Since returning home, Rana has been working on a series of paintings that reflect the poverty of both Pakistan and the United States. In addition, Rana’s painting has been infused with meaning and purpose through her experiences in serving meals to people who are homeless in Tallahassee. In January 2011, she established the Tallahassee chapter of Project Downtown, an organization that was originally founded by three college students to assist the hungry in downtown Miami while actively putting into practice the charitable principles of Islam. The organization now has nearly 20 chapters across the nation. For her Bachelor of Fine Arts thesis project, Rana is creating a series of tents, which she hopes to display on campus during the spring 2012 semester to attract attention to the plight of the homeless. The tents will be roughly 9 feet tall and made of brightly colored, used, worn or discarded fabrics from Pakistan and Indian, or inspired by those regions. In juxtaposition with the richness of the fabric, the tents will be filled with photographs depicting people who live in poverty. “I hope people will appreciate the beauty of the tents, but also associate the work with the darker reality of poverty,” Rana said. Lilian Garcia-Roig, the Florida State professor of art who taught Rana painting, is supervising the thesis project. After Rana graduates with her Bachelor of Fine Arts degree, she plans on earning a Master of Fine Arts degree in painting and a master’s degree in art education from Florida State.